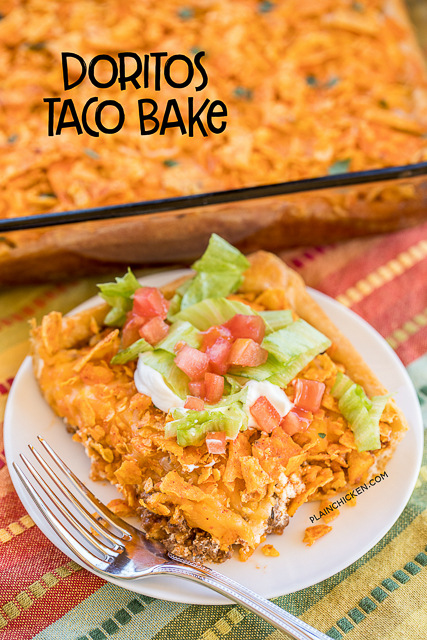 Doritos Taco Casserole Bake - OMG! SO good! 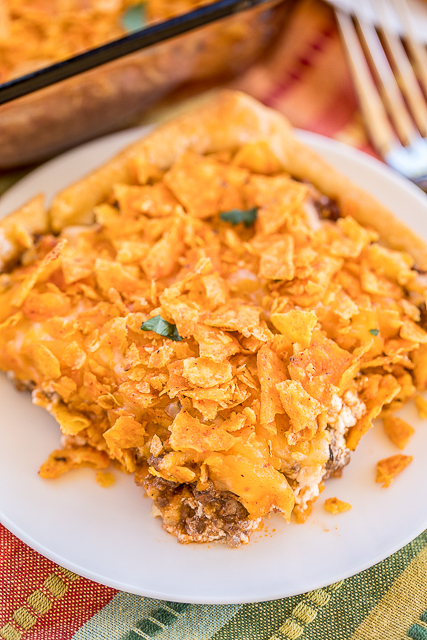 crescent rolls topped with taco meat, tomato sauce, sour cream, cheese and doritos! Kids gobble this up! Ready in 30 minutes. Quick,easy, kid friendly and delicious! You can't beat it! I am a firm believer that everything tastes better covered in Doritos. Don't you agree? 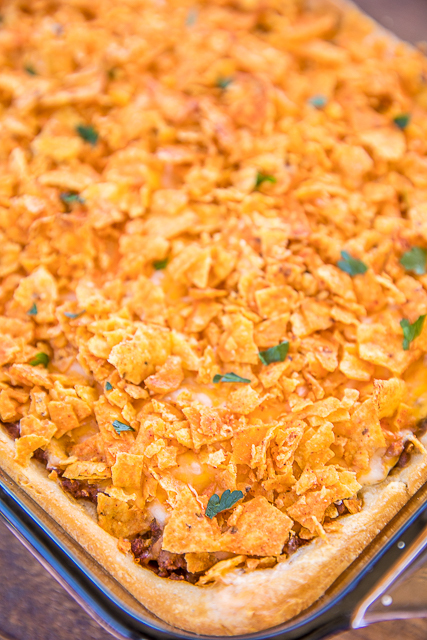 We recently made a Cheesy Chicken Doritos Casserole, and we both loved it. I decided to make a beef taco bake for dinner this week. Actually, this was so easy that Chicken Legs made it for us. Holy Yum! This tasted like our favorite Taco Dip covered in Doritos. We were both in heaven. Feel free to add olives, diced tomatoes or even black beans. Make it your own - just promise me you'll make it! In a large skillet, brown ground beef. Drain off fat. Stir in taco seasoning and salsa or tomato sauce, simmer 5 minutes. Press crescent rolls on the bottom of a 9x13 pan lightly sprayed with cooking spray. Press seams to seal. Top crescent rolls with meat mixtures. Spread sour cream over meat. 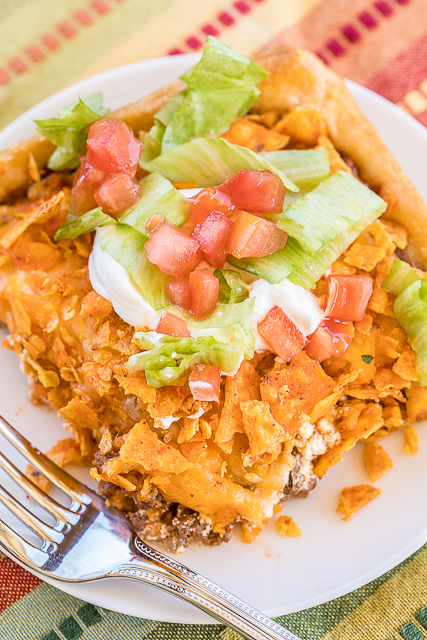 Top with cheese and crushed Dortios. This does look really really good! Made this last night-I used enchilada sauce instead of tomato-added a can of rotel & can of green chiles & 1T of cornstarch to thicken it up a bit. Used taco flavored Doritos! Everyone ate it up! Thanks for the recipe! I made this tonight for dinner...super tasty! So tasty...mine was pretty spicy though. Couldn't figure out if it was because of the regular doritos I used or the trader joes taco seasoning mix, but it was mmmmmmmm.....good! Do u think u can freeze this? Candace - I think it would freeze fine. I wouldn't freeze it with the chips on top. I would add the chips when I was ready to bake it. Made this tonight and it was a hit!!! !